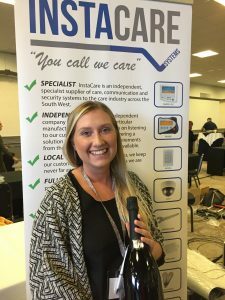 InstaCare Systems attended the Caring UK Conference in Torquay yesterday. It was great to see so many of the local care homes there, to see familiar faces and meet new ones too! As part of the event, we ran a free prize draw and our lucky winner was Sarah Meneilly of Durnsford Lodge. Huge congratulations to you Sarah, we hope you enjoyed your prize!